'None of this makes sense,' admits Hawkeye (Jeremy Renner) in a way that suggests logic matters little. The 11th film in the Marvel Cinematic Universe and sequel to Joss Whedon's Avengers Assemble once again combines the irreverent charm of its returning writer-director, the star wattage of Robert Downey Jr, Chris Hemsworth, Scarlett Johansson et al, and the franchise's sanity-be-damned spectacle. Earlier this year Ex Machina took a low-key, intensely philosophical look at artificial intelligence; Age of Ultron's plot pivots on that same subject but it does things a bit differently. Its 'big bad' Ultron is the rogue creation of Tony Stark (Downey Jr), the result of mad science and rampant hubris. Voiced with relish by James Spader – even if some of the edge fails to get past his CGI shell, Ultron has been devised to keep the peace but quickly makes it his mission to exterminate the Avengers, assisted by a robot army and twins played by Aaron Taylor-Johnson and Elizabeth Olsen ('He's fast and she's weird,' we're told). There are twists, turns, cameos aplenty and, as ever, a McGuffin to chase but, plot-wise, that's about the size of it. If the women are hopelessly outnumbered then proud progressive Whedon makes sure their actions count. Johansson and Olsen (sporting a dodgy Eastern European accent but delivering conviction) play a major part in the action with the capable Cobie Smulders in support and the wonderful Linda Cardellini and Julie Delpy popping up in small roles. Nice touches include the team indulging in their own brand of 'revels', Andy Serkis' brief appearance as iconic cretin Ulysses Klaw, and Ultron's sinister appropriation of Pinocchio's 'I've Got No Strings', while fans of supersized set-pieces will enjoy a beefed-up Iron Man's attempts to contain the rampaging Hulk (Mark Ruffalo). There are surprises but nothing as ingenious as in, say, Iron Man 3. The charismatic ensemble have their roles down pat (Thor's pomposity and hammer once again prove a rich source of humour) and Whedon's script is strong and snappy. Yet incorporating this many cast members and fan-pleasing elements comes at a price and it's all too abbreviated to have any real emotional impact, perhaps fitting for a world where death isn't really an option and colossal havoc results in almost zero visible casualties. 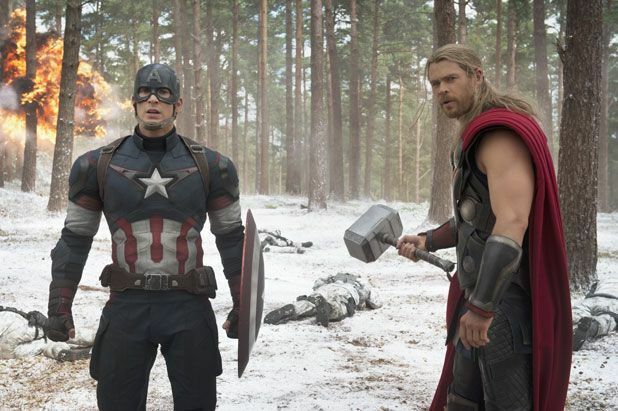 'You get killed, walk it off,' quips Captain America (Chris Evans). Nevertheless, it's hard not to admire how efficiently and enjoyably the myriad elements have been threaded together; Age of Ultron is a suitably well-oiled machine with an insatiable appetite for, family friendly, destruction. General release from Thu 23 Apr.